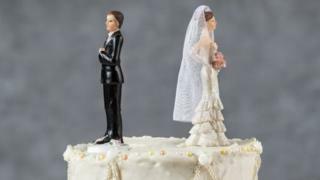 There were 102,007 divorces in England and Wales in 2017, according to the latest figures from the Office for National Statistics (ONS). Age at marriage is considered to be closely linked to the risk of divorce, with those marrying in their teens and early 20s at greater risk. But what does it feel like to be married and divorced in your 20s? Sophie Morbey says she knew she was making the right decision when she filed for divorce from her husband in 2016. She was 24 when she married in a "big, expensive" ceremony in Cornwall in September 2015. The opinions of Sophie's family and close friends were what worried her the most when she said she wanted a divorce, despite "nobody saying anything negative about what I was doing". "I was worried about what they would say about me only being married for 14 months and the fact I wasn't sticking to what we had said in our vows, not fighting for it. "It made me feel quite ashamed. "None of my family get divorced and with me being the baby of the family, I was feeling like I was the one who messed up." For Sophie, from Plymouth, her attitude to marriage has completely changed and she says she would not be with someone now "for the sake of legal papers". "Divorce is not a nice process - the way it affects you mentally is quite negative. "I don't feel like I want to get married again to someone for the sake of having a legal bind between us. "I was unhappy long before I initiated the divorce but didn't want to go through it because I knew what would happen," she adds. Sophie met her current partner when she was separated from her husband and credits him with helping her through the split. "He knows marriage isn't a big deal to me any more," she says. "I'd be quite happy to be settled in a relationship and have the commitment there which is genuine and true. He's very respectful of that." Despite her own changing views on marriage, Sophie says young divorcees should "never say never" about tying the knot again. "If people who have been divorced feel like they want to get married again, don't write it off. It's a personal decision. "Don't use what happened in the past to make your decisions in the present, if it's going to affect your happiness in the future." Victoria Cox married in May 2015 at the age of 25 but within six months she was separated, and the divorce papers were signed a year later. "We had two children together and when he proposed, we were both obviously in love and I thought that would be it," she says. "So we booked the wedding - but it didn't work out." After the divorce, Victoria, from Chester, admits she did feel worried about going forward with "baggage" and being labelled by others. "It's not a very nice topic to bring up - especially because it was only a six-month marriage. You kind of get people laughing at it. "And you always think what new people will think once you've started dating them and tell them. Some people don't like it." Victoria is now in a new relationship with a "supportive" partner who told her he "understood everyone had a past" when she brought up her divorce. But it wasn't until she found him that she felt the need to start thinking about changing her married name. "I had children with my ex-husband which is why I kept the name but I have changed the surname now back to my maiden name," Victoria explains. "It did feel a bit weird having my ex-husband's surname when I was in a relationship with somebody else. It just felt odd." Straight after the divorce, Victoria says she vowed to "never, ever get married again". "When I saw people that had got engaged, I would think 'how long will that last?' because my faith in men had diminished. "But now, being with my partner, say if we're together for a long time, I would contemplate it. It would be nice to be married to someone who respects me and loves me." Image caption Claire Frank says her divorce "was almost like a celebration"
For Claire Frank, from Stotfold in Bedfordshire, getting a divorce was a "relief". Eighteen months after marrying her partner of four years and the father of her 18-month-old baby, the couple split up. Claire was 24 when they married in 2012 and the divorce was finalised just after she turned 28 - three years after saying "I do". "I think it felt worse until I actually got the divorce," she explains. "When I got the divorce it was almost like a relief - that I was no longer tied to this person. "I always say to people I'm happily divorced - I'm happy about it." Claire even joked about throwing a divorce party, saying it "was almost like a celebration". After having twins with her ex-husband shortly after the wedding, Claire says her focus is her three children and she has not been in another relationship since the marriage ended. "I've got baggage, so to speak, because I've got my children, but so have a lot of other people - it's so much more common now," she says. "I don't think it's something people talk about that much - it's almost a bit of a taboo topic. "I think the expectation to meet a partner when you're 31 who doesn't have a previous, serious relationship though is unrealistic. "In some ways, I think it's just how times are now." So can Claire ever see herself getting married again? "I think it's unlikely - the divorce has devalued marriage in my opinion," she says. "It's not to say I don't believe in marriage but I think having been married, spent a lot of money on a wedding, and then to be divorced, makes me think a lot of it is for show. "I think it's made me look at it differently."